Priced to sell quickly! 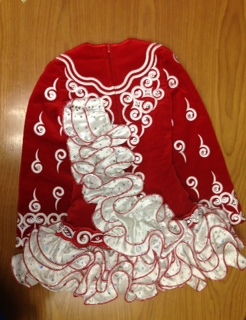 This is a gorgeous, sparkly red and white dropped waist Siopa Rince to fit average 7-8 year old or slim 9-10 year old dancer. 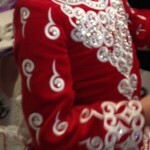 Material is red velvet with white embroidery and loads of genuine Swarovski SS42 crystals. Skirt is white sparkle satin with tiny AB sequins and thin red edging. This dress took our daughter from novice to prelim and we are only selling due to growth spurt. Bloomers are white and red polka dot that match the underskirt of the dress. The dress is in gently used condition – no odors, no missing crystals, and no fake tanner marks on the skirt. The only alteration that’s been made to this dress was the removal of one ruffle on the bottom to shorten it as our TC likes the skirts on the short side. 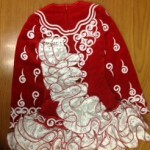 (It was done by a professional seamstress who makes dresses for our school.) I have the additional ruffle that can be easily added to the bottom of the skirt by simply untacking the underskirt and sewing the ruffle back on.